Nigerian Seafood and Coconut Jambalaya. Okay first of all what is Jambalaya? Jambalaya is pretty much Creole “jollof rice” cooked with so many goodies including smoked sausages and some creole seasonings. I had my very first Jambalaya when I was pregnant with Ajebutter1; and after that, I have made so much of it that it has become part and parcel of my kitchen. On the day I tried this recipe, I was too pleased. I was so pleased that I did not even bother with the camera. I took about two pictures and I dug in. If you are not a sausage person or fan, try using some smoked salmon and stir it in towards the end; You will loveeeeeeee it! Another reason to love this recipe is the use of Old bay seasoning. I you do not have any of the creole stuff; then any bouillon works. 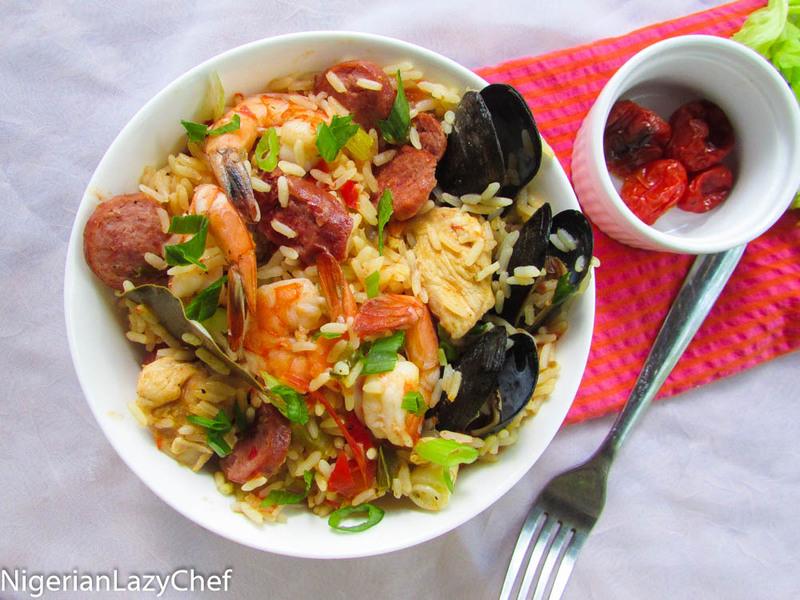 I have seen so many recipes for Jambalaya, but I really prefer this recipe. Not because it is mine, but because it is so good. I really enjoy coming up with simple one pot recipes that work. And as much as I really want to keep going on and on about this recipe, I really want to share this recipe for your pleasure. in a heavy bottomed pot, heat the coconut oil and butter. Sauté the chicken and sausages until brown. Add the onion and sauté until almost translucent; then add the garlic, bay leaves, thyme and ginger and sauté until fragrant. Add the celery, tomatoes,and bell peppers and cook until the tomatoes have reduced; then pour in the rice and stir until each grain is coated with the oil. This entry was posted in chicken, chicken dishes, Chicken Recipes, Coconut Fried Rice, coconut jollof rice, Coconut Rice, jollof, Jollof rice, Lunch, Lunch ideas, main dishes, main meals, Meat dishes, Nigerian Rice Recipe, Nigerian rice recipes, Rice, Rice Dishes, Rice Recipes, sea food, sea food recipes, Seafood, Side dishes, Sides, Uncategorized and tagged creole recipes, how to make jambalaya, Jambalaya recipes, Nigerian food blog, Nigerian Jambalaya, Nigerian Lazy chef.